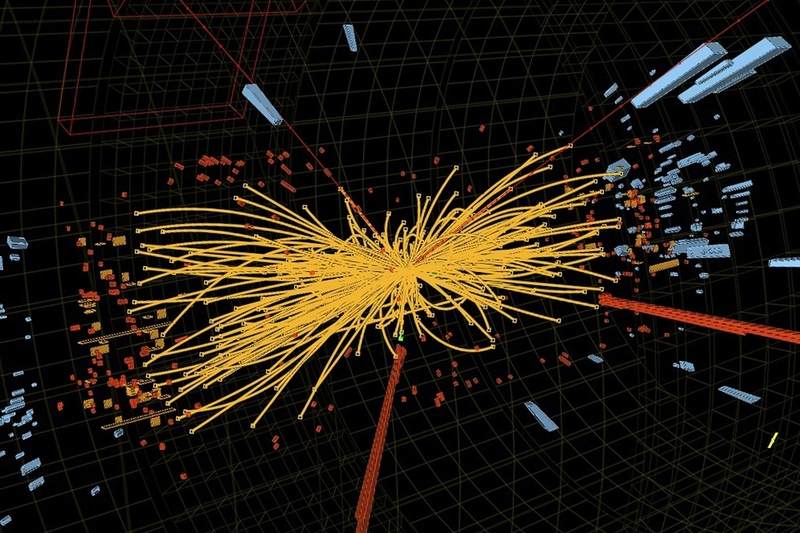 CERN Discovers A New Particle, Likely The Higgs Boson : The Two-Way The Higgs, credited with giving particles mass, was the missing piece of the Standard Model of physics. Without it, the world would be a massless mess of photons flying at light speed. Two teams of scientists using the Large Hadron Collider at the European Organization for Nuclear Research, or CERN, announced in Geneva this morning that they have detected a new subatomic particle that bears the hallmarks of the elusive and highly sought after Higgs boson. 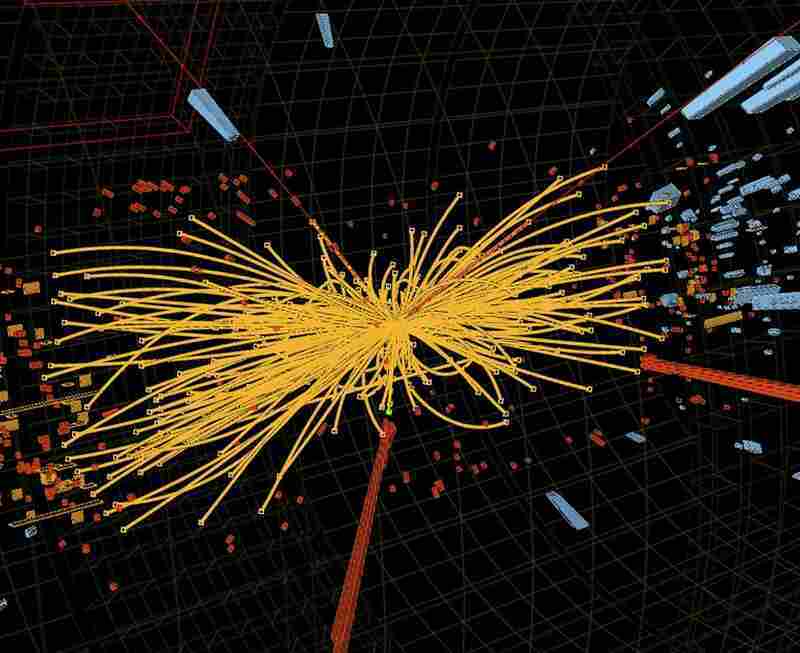 In layman's terms, the Higgs is referred to as the "God Particle" because the field it produces gives atoms their mass. Were it not for the Higgs, the world we know would be completely different — there would be no chemistry, no architecture, no us. It would be a massless mess of aimless particles running around at light speed. In a press release, ATLAS experiment spokesperson Fabiola Gianotti said the preliminary results were attained with a "5-sigma signal," which is significant because it sits right at the threshold for what scientists consider a true discovery. 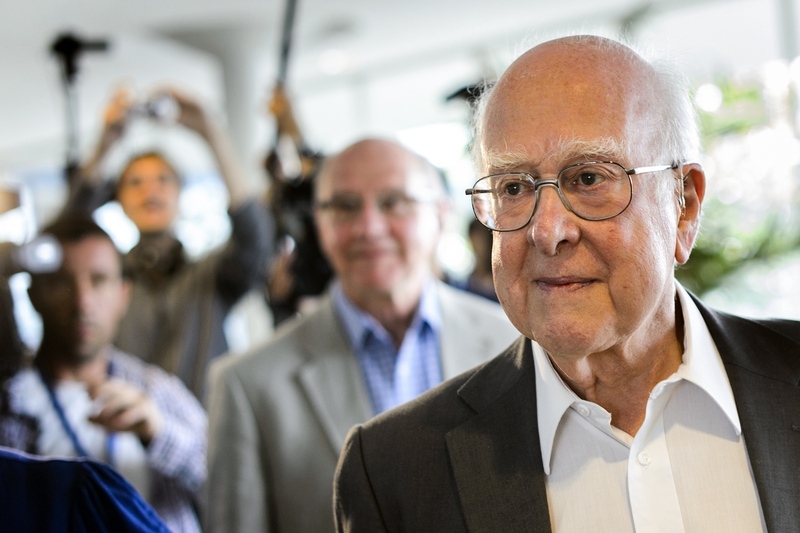 British physicist Peter Higgs, right, arrives for the opening of a seminar to deliver the latest update in the 50-year bid to explain a riddle of fundamental matter in the search for a particle called the Higgs boson. "This is indeed a new particle. 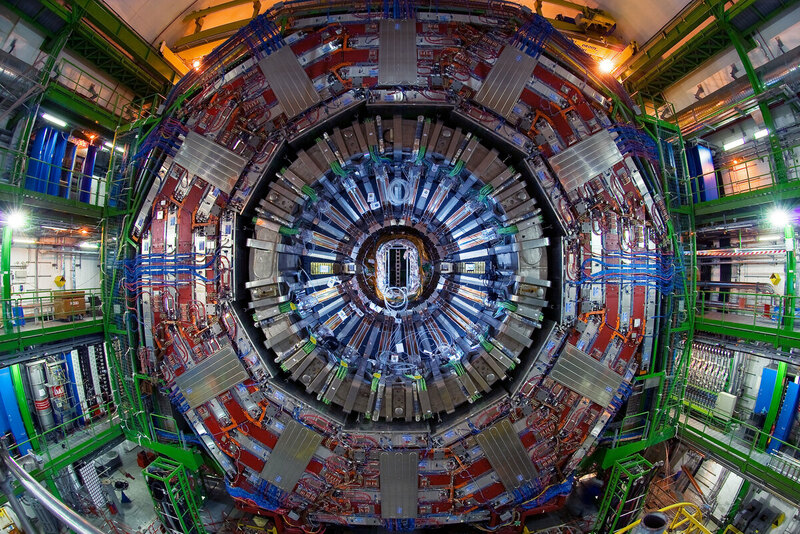 We know it must be a boson and it's the heaviest boson ever found," said CMS experiment spokesperson Joe Incandela. "The implications are very significant and it is precisely for this reason that we must be extremely diligent in all of our studies and cross-checks." An undated handout graphic distributed on July 4, 2012 by the European Organization for Nuclear Research (CERN) in Geneva shows a representation of traces of traces of a proton-proton collision measured in the Compact Muon Solenoid (CMS) experience in the search for the Higgs boson. To make the observations, scientists at the LHC sent particles crashing at tremendous speeds to try to create Higgs. Then, because the particle only exists for a billionth of a billionth of a billionth of a second, scientists looked for its signature decay. 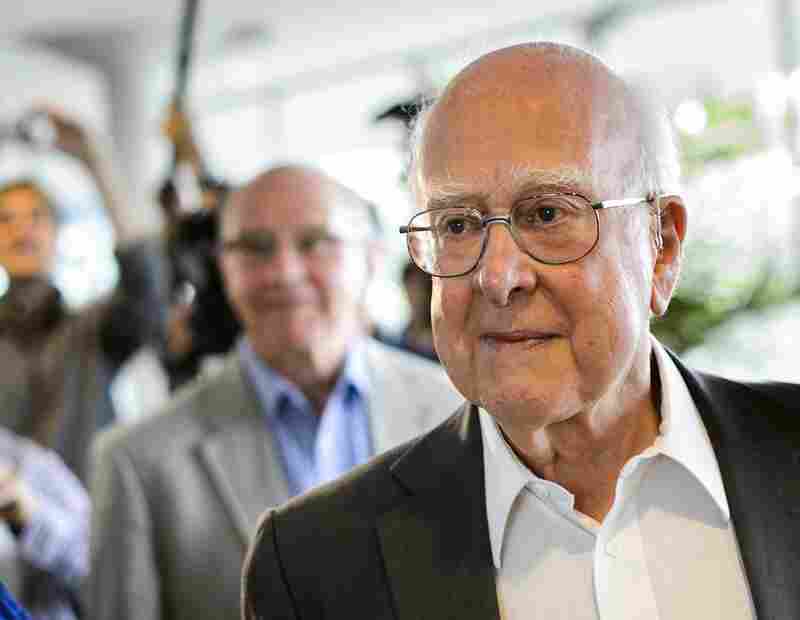 The scientists said they had detected what are likely Higgs trails — a bump in their data — with a great degree of certainty. The announcement is one of the biggest scientific breakthroughs in decades and could put the finishing touches on Standard Model particle physics. "It's hard not to get excited by these results," CERN Research Director Sergio Bertolucci said in a statement. "We stated last year that in 2012 we would either find a new Higgs-like particle or exclude the existence of the Standard Model Higgs. With all the necessary caution, it looks to me that we are at a branching point: the observation of this new particle indicates the path for the future towards a more detailed understanding of what we're seeing in the data." Q: I've heard many metaphors for what this Higgs boson is. A basic explanation is that it's the thing that gives subatomic particles their mass. The best metaphor I've heard is from Fermilab's Don Lincoln, who says the energy field made by the Higgs is like water. Depending on your mass you'll move through the water with ease — like a barracuda — or slowly, like a big, fat man. How would you explain the Higgs to a friend at a bar? A: In a bar, I'd probably use one of those analogies. The real important thing for me is that fundamental particles are as far as we can tell zero-dimensional particles. They have no radius. You can't think of fundamental particles as being glass marbles. They literally have no extension in space. They can never bump into anything else. It's all about interactions. It's about them exchanging other particles as forces. With a particle like the electron — what gives the electron mass is really inertia, that's the property that we associate with massive particles. Mass and inertia go together. So since an electron or a quark has no extension in space, you sort of wonder where did the mass go? Well it's not that the mass resides with the electron or the proton. It's that the mass comes from its interaction with other things. And in this case, it's the Higgs field that gives this point particle — the electron — the appearance of inertia. That is what allows it to act like it's resisting changes in its motion. Whereas you have other particles like the photon which has no mass, and because of that it can go at the speed of light, whereas a massive particle will never be able to go at light speed. Q: So, if the Higgs didn't exist, what would the world look like? A: It would all be photons. Everything would be moving at the speed of light, right. Which means at light speed, you wouldn't be able to have the kinds of structures we see today. You'd never get atoms and chemistry and rocks. So it's really important. The property of mass is really important for getting clumpy structures, essentially, like us. Q: The particle has been described as the missing piece of the Standard Model. Is that a fair characterization? A: Yeah, pretty much. So the Standard Model is this beautiful edifice of modern particle physics that's really 40 years old. The pieces were really in place 40 years ago and people have just been going around and discovering them. The theory — the Standard Model predicted all these different pieces 40 years ago — and the quarks were part of it, the different flavors of neutrinos, some have been discovered and essentially the top quark was the last big thing that needed to be discovered and that was discovered in the mid-90s. And the Higgs boson, which was predicted not just by Peter Higgs but six different physicists at the same time, is the last piece of the Standard Model that needs to be discovered, that needs to be shown to be true. One of the interesting things about this is that for particle physicists, they're in a bit of a conundrum, where they've been working on the Standard Model for all these years. And the Higgs particle is an enormous achievement, but it's also for them a little bit boring because they've been expecting this for 40 years and they keep looking for ways to go beyond the Standard Model. Q: Another thing I find interesting, though, is that despite this announcement, scientists have never actually seen the Higgs, right? A: You're never going to get the Higgs to appear in a laboratory and float. It's very short-lived. What happens in particle physics is that particles decay into other particles, just like with radioactivity. The Higgs does that but in a very, very, very short time scale — so short that you're never going to be able to see the Higgs directly, you're going to see what it turns into. And there are a lot of different ways it can turn into other things. There are a lot of different channels. What we're looking for is different possible channels. And that's how they're going to tell if it's a Standard Model Higgs. It'll have a certain kind of decay pathways. Q: Fermilab, the American organization with much smaller version of the LHC, made a similar announcement on Monday, saying they had identified those decay pathways, except they said they had fallen short of a 3-sigma standard, which determines strong evidence. Can you tells us what that means? A: A definitive discovery is a 5-sigma result. What do we mean by these sigmas? Really it's all about how sure are we that what you're seeing is not noise, is not just a statistical anomaly. The higher your sigma, the more statistically you're certain what you're seeing is not just something crazy that's happening in the background. With the Tevatron, which was Fermilab's particle accelerator, in many ways, scientists hoped they would be able to see evidence of the Higgs. With these particle accelerators, you want to have enough particle collisions that you have lots of statistics and the problem with Tevatron is that even though it ran for a long time, it wasn't powerful enough to create lots and lots of collisions so that they could very quickly see if they were getting a high enough sigma result. Unfortunately the government said, OK we're done with the Tevatron. But they did have 10 years worth of data to play with, so they did this very deep, very powerful statistical analysis and they found — and they of course announced in on Monday to take a little bit of the thunder from the LHC — this signature of the Higgs. Q: What's next for physics? What's the next frontier? A: Astronomy. [Laughs] If they discover the Higgs, there's going to be lots of interesting things to do with trying to make lots of them and probe their properties. They're going to learn a lot from that. And they're still going to hope they're going to find things that break the Standard Model — new physics they often call it. They're going to find something in the LHC that really looks very different than the Standard Model. If they can't get beyond the Standard Model that will be a problem for them. If everything they find is in line with the Standard Model, it'll feel like a dead end. If nothing they see goes beyond the Standard Model, they're going to say, "Well nature isn't showing us where do we go from here, so where do we go from here?" Q: Let's back up a bit. You have a vested interest in saying astronomy. But what do you mean by that? A: Doing physics in this way — of smashing things together with ever larger machines — we are clearly sort of reaching a limit of how big these machines can get, or what people are willing to fund, let me put it that way. So in order to go to even higher levels of energy, you know colliding things at an even higher level of energy, you have to rely on nature. You have to look to astrophysical conditions. You have to look at the beginning of the universe and the big bang or the environments around black holes to find environments where interactions between particles are so violent that you are getting insights to regimes beyond the Standard Model. A lot of high energy physicists are looking to astronomy and astrophysics as being their next particle accelerator, you know nature's particle accelerator.